One of the most difficult things to do in any IT infrastructure is to establish what normal operations look like. The extremes are always easy to spot, of course, but the heavy demand that equates to normal business use is much more difficult to understand without good visibility. Establishing normal operations can be more complex in a virtual infrastructure but no less important. If you are not sure what normal is, how can you properly identify what is problematic and needs to be investigated before it impacts your end users? This issue is critical in a virtual desktop environment because often much higher expectations are placed on performance. I had a conversation about this topic with a customer who had a mixture of older and newer physical desktops, and what we concluded is that users often do not report problems with physical desktops that are fixed with a reboot; they simply shut it off and on, and if the problem goes away, they consider it “fixed.” Ask yourself how often the computer logs of a desktop are actually inspected for problems. When was the last time a system administrator looked at the application or system log of a Windows desktop? With virtual desktops, however, these hiccups get a lot of visibility in the early stages of adoption, so you need high visibility on how everything is performing. This visibility must include the View desktops, management components, performance of the PCoIP protocol on the LAN and WAN, and the hosts and storage of the vSphere environment. Monitoring all these pieces with traditional monitoring tools can quickly produce a lot of information that becomes difficult to correlate and understand. Traditional monitoring tools based on static thresholds generate alerts on utilization or monitor the Windows Event Viewer logs but do not provide a complete picture of the how the entire environment is performing. Although a number of products from a variety of vendors monitor various aspects of the virtual infrastructure, VMware has developed vCenter Operations to bring this capability to VMware vSphere environments. It also has developed custom dashboards for monitoring the performance of a VMware View environment to extend the benefits to your virtual desktops. What is unique about vCenter Operations (vCOPs) is that you get near real-time, capacity, and historical performance and problem-tracking information. The visibility extends to all components of your virtual infrastructure, down to the storage and its dependencies. Many third parties have also used the VMware APIs to extend monitoring and alerting to their products, but vCenter Operations is tightly integrated with VMware View. vCenter Operations Manager aggregates information that is collected by vCenter. For vCOPs, you need to ensure that you are running VMware vCenter Server 4.0 Update 2 or later at a minimum to be able to view storage system performance. Storage visibility closes a huge operational gap in running large virtual desktop environments. Often you see symptoms of underperforming storage, such as delayed SCSI transactions in the Windows Event Viewer. However, it is difficult to identify what the cause is. Because many storage systems incorporate storage virtualization and distribute all writes across all spindles, it is difficult to pinpoint the source of the problem. It is rare now that a SAN administrator dedicates certain drives to certain LUNs. This can make identifying storage bottlenecks extremely difficult because SAN performance reports average performance over time and across a large portion of the storage system. vCenter Operations allows you to view specific performance characteristics of your datastores in relation to each other. VMware has extended vCenter Operations to aggregate information from both the View Connection Server and Composer to provide even greater visibility into your virtualization environment. The benefits of vCenter Operations are many, but rather than go through them all, let’s look at each in relationship to the VMware View environment to understand how they deliver value. The first thing you must do is install vCenter Operations and configure the adapter to turn on the performance and monitoring of the VMware View environment. vCenter Operations (vCOPs) Manager ships as a virtual appliance and comes in several different versions; Standard, Advanced, Enterprise, and Enterprise Plus. The fundamental difference between each version is that Standard does not integrate the historical trending, reporting, and capacity planning features. Advanced does but does not allow you to customize the look, or dashboard as it is called. Enterprise does allow you to customize the dashboard but is restricted to virtualization environments only. Enterprise Plus allows you to apply the tool to both physical and virtual environments. For a complete list of differences, refer to the VMware comparison matrix located at http://www.vmware.com/products/datacenter-virtualization/vcenter-operations-management/compare-editions.html. vCOPs can be extended to input additional metrics through the use of adapters. The visibility into VMware View is facilitated through an adapter and the creation of seven VMware View specific dashboards to display information such as user login times, virtual desktop performance, and overall health of the environment. Because it does install several custom dashboards, you do need Enterprise to turn up these features. For an overview of vCOPS integration, refer to http://www.vmware.com/products/desktop_virtualization/vcenter-operations-manager-view/overview.html. Historically, the product was developed from both Capacity IQ and vCenter Operations. In vCOPs 5, the two independent products have become one. They are still two distinct virtual appliances—the analytics and user interface (UI) appliances—but they are deployed as a single unit or vApp. A vApp is a collection of virtual machines that are grouped to allow common configuration and to provide a complete service. For additional details on vApps, refer to the vSphere 5 documentation available online at http://pubs.vmware.com/vsphere-50/index.jsp. vApps were introduced as a method of controlling multitier applications. In this case, the vApp allows you to control the network, shares, and boot order as a single entity. In the case of vCenter Operations, it ensures that the Analytics virtual appliance is booted before the UI appliance. vApps are designed to work with IP pools. IP pools add a DHCP-like service that is associated with certain switch ports. As with DHCP, you configure a range, gateway, and DNS settings. After these settings are configured, you can tell the vApp appliances to use them by editing its properties and changing the IP allocation policy from Fixed to Transient. 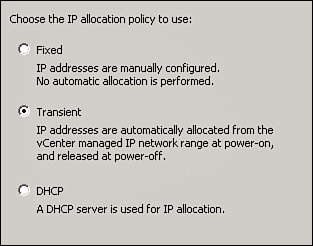 The three types of IP allocation policies are Fixed, which is a static IP assignment; DHCP, which tells the vApp that a traditional DHCP service exists on the network; and Transient, which tells the vApp that an IP pool is available to allocate network information (see Figure 1). Figure 1. IP allocation pool.